Soaring is a complex sport. Many different skills are required to become proficient. Every instructor will tell you that the best way to develop these skills is to fly a lot. Unquestionably this is true. Unfortunately, flying a lot isn’t always easy, especially for beginners. Unlike experienced pilots, who are able to soar on almost any day of the thermal season, inexperienced pilots often need near-perfect conditions to fly, stay up, and practice. If the conditions aren’t great (e.g. the thermals are relatively weak, wind-blown, narrow, inconsistent, further away from the airfield, etc. ), their flights are often short, and thus their soaring practice remains limited. This can be frustrating, and, considering the number of tows involved, it is also expensive. Unfortunately, many new soaring pilots give up at this stage. In fact, the statistics from my club, the Soaring Society of Boulder, show that new members who fly less than five hours in their first year have a more than 50% likelihood of quitting their new hobby before their second season even starts. That’s a real shame if you think of all the time and money that they have already put into their basic training. But also consider this: those who fly more than 5 hours in their first year have an 80% probability of continuing with the sport! So what can new pilots do to cross the five hour hurdle? Fortunately, there is a simple, effective, and inexpensive way to supplement the basic flight training and quickly develop many of the key skills that are needed as a soaring pilot. It is called Condor, a remarkably realistic simulator for soaring flight. If you already have a PC with a decent graphics card, all you need is the software, a suitable joystick, and preferably rudder pedals, and you are set. All of that can be had for the cost of a few tows – see details at the bottom of this post. I promise it is the best investment any aspiring soaring pilot can make! To avoid any misconception: Condor alone is not a substitute for real-life flight training. But I have absolutely no doubt, that it has saved me dozens of real tows and dramatically accelerated my learning curve as a soaring pilot. Below are some examples of how Condor can help you quickly develop your skills . These skills will allow you to become more proficient more quickly, you will be less dependent on perfect days, and you will have the opportunity to gain more real glider time and experience sooner, and at lower costs. 1) Thermalling – The thermals in Condor are exceptionally realistic. Condor will teach you where to find the best lift, how to center the lift, and how to fly consistent circles with constant airspeed and a constant bank angle. These skills translate perfectly to the real world. I am completely confident that anyone who can center thermals in Condor can do the same in real life. Of all the foundational skills (beyond taking off and landing safely), this one is by far the most crucial if you want to be able to stay up and go places. Condor also lets you set the average width of thermals, the level of turbulence, and the upper level wind speed so you can practice thermalling in more difficult conditions as you get better at it. Thermalling with another glider during a multiplayer online race in the Alps. I’m flying a Diana 2 (note the side stick). The Condor flight computer shows the thermalling assistant and the average climb rate during the last turn. 2) Ridge Soaring – Many soaring sites don’t have good ridges for soaring flight. Condor allows you to practice ridge running in various wind conditions and experience the effect of lee side turbulence and sink without putting your life at risk. Your first ridge flights in real life should always be with an instructor but it will be instantly familiar to you once you master it in Condor. Running along the ridge of Mount Nebo near the airport of Nephi in Utah in 15kt westerly winds. The glider is a JS1. 3) Wave Soaring – Since the recent release of version 2, Condor also does a good job at modelling wave lift although it is not as realistic yet as thermal and ridge flying. (Especially rotor turbulence below the wave bars is not modeled well, and the interaction between thermals and wave is also not very realistic. ) However, mastering wave flying in Condor will still be of help when you first experience it in real life; e.g. the geographic relationship of the wave trigger and the position of the wave lift is well done and you will have learned the necessary flying techniques to stay in wave lift. 4) Take-Offs and Landings – these skills are actually harder to master in Condor than in real life. If you can follow the tow plane and box the wake in Condor you will likely have little trouble doing the same in a real glider. Landing in Condor is also a bit more tricky. A key benefit of Condor is that you can practice things that you wouldn’t do in real life such as taking off and landing in extreme conditions. One day you may find yourself in a situation where you have no choice but to put your glider down in a 25 kt crosswind or quartering tailwind. It’s definitely helpful having practiced this on the simulator. You can also do these maneuvers over and over again without incurring any additional cost. Aerotow takeoff in Nephi in an ASK 21 behind a Super Cub with 27 kts cross-wind. You can see the glider drift immediately to the right of the center line despite the crab angle. The maximum demonstrated cross-wind component for the ASK 21 is 8 kts. So you definitely would not do this in real life. But it’s fun to practice it in Condor. One great thing about Condor is that it was originally developed for glider racing. That means, the learning doesn’t stop with the basics. In fact, there are a lot of advanced skills that you can readily practice in Condor that are difficult to practice in real life. 1) Using a Flight Computer. As you progress and get interested in cross country soaring, you will want to become proficient in the use of a flight computer. Condor has one built-in, which is easy to use, and a great tool for online racing helping you with navigation around the task, speed-to-fly calculations, and final glide. But, even more important, Condor gives you the opportunity to directly connect your real life flight computer with Condor (e.g. an Oudie). This way you can practice flying particular tasks using your own real-life flight computer. I have found this to be a huge benefit. Flight computers tend to be pretty complex and the last thing you want to do is stare at a screen when you sit in the cockpit of a real glider, trying to understand what it’s telling you, while you really ought to pay attention to what’s going on outside the cockpit. Not only will you not be able to use the flight computer to your benefit, you are also a safety hazard to yourself and anyone around. Practicing this in Condor is a great way of becoming proficient without the risks. 2) Terrain Transitions. Condor was built to fly cross country. One of the trickiest aspects of XC flying are terrain transitions, especially upwind in mountainous regions. You’ll learn how much extra height you need to cross a mountain pass when flying into the wind, and you’ll figure out where and how to best gain that height. Approaching a tricky terrain transition across the pass straight ahead. The wind is from the southwest and the vario shows a modest climb rate of 1 m/s (2 kts). I’m counting on additional ridge lift from the slopes to the left before sliding over the pass and into the next valley beyond. There is likely some sink in the lee of the steep mountain to the right of the canopy before getting to the ridge that I have to cross and I need to gain some more altitude quickly. I probably have another 10-15 seconds or so to decide whether I can make it or if I should turn away to the right, come back to the ridge, and try to climb higher before shooting over the pass. This is definitely a very tricky situation of the variety “do not attempt this in real life”. But it is very educational in learning to judge the relationship between terrain and wind, and the glider’s energy in form of height and airspeed. 3) New Terrain. Condor has a very committed user community. Several talented members put in many hours developing photo-realistic sceneries for many of the world’s best soaring areas. Many of these can be downloaded for free at the Condor Club fan site. E.g., you can fly in the Alps, in New Zealand, the Andes, the Atlas, the Pyrenees, etc. I have recently practiced in the Nephi scenery in preparation for a real life soaring camp in Nephi, UT this summer. Being familiar with the terrain is obviously hugely beneficial before you fly at a new location. 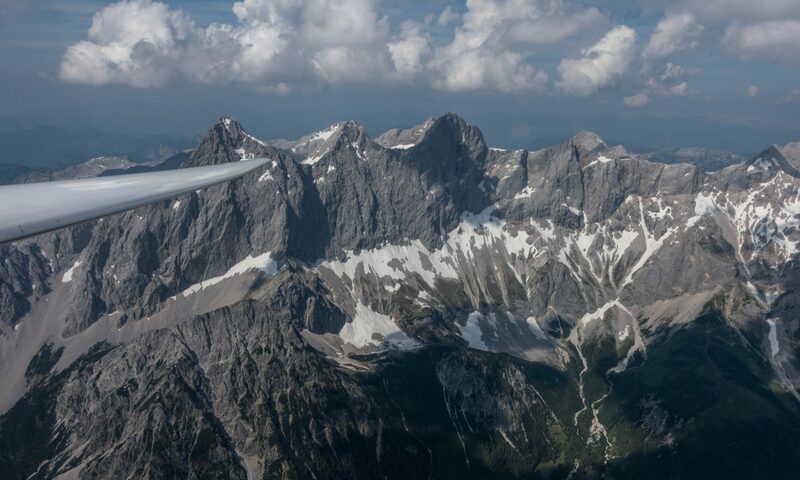 This is an image of the Dachstein mountain near the airfield of Niederoeblarn in Austria where I first learned to fly gliders. It’s taken from a similar perspective as the cover picture on my blog ChessInTheAir.com. In Condor I am flying an LS8neo whereas in the real image the glider is an LS4b. 4) Flying in Different Gliders, with and without ballast. Condor is realistically simulating many different gliders from frequently used school gliders (e.g. ASK 21) to the latest and most expensive racing machines (e.g. Ventus 3, JS1, ASG 29, Antares, etc.) The Schweitzer 1-26 is also supported as well as several other historic gliders. A number of gliders comes standard with the software package, others are available for an extra fee. You can experience the different handling characteristics of different ships with and without water ballast, and with different CG positions. Obviously you can also practice flying with flaps if you select a flapped ship. Outside of Condor it is unlikely that you will get the chance to fly an open-cockpit Grunau Baby in ridge lift along steep Norwegian Fjords. It’s fun to try out the completely different flight characteristics of different gliders. 5) Glider Racing. Perhaps the coolest thing about Condor is live multi-player racing against the world’s best Condor racing pilots. Many of them are experienced racing pilots in real life and you can test your skills in live competitions. After a flight you can compare your flight trace against the traces of those that were faster and see where you lost precious minutes on task. You also experience flying in big gaggles – there are many races with 30, 40, 50 or even more other gliders, all of which you can see live on your the screen. Most scoring is based on the 1000 pt format used for real glider races, and some races are scored based on the Grand Prix format with regatta starts. Races can be high adrenaline events and a lot of fun. Here I’m on the grid waiting to be aerotowed during a multiplayer online race. You can display/hide a directory of the other competitors with a key stroke. This was one of the first online races following the release of Condor 2 and the Diana 2 was the only 15m class glider supported at that time. In the meantime you can also fly a Ventus 3 in 15m configuration. As I tried to point out, Condor is a fantastic tool to help anyone (from beginner to advanced pilot) hone their skills and become better at real soaring. It is remarkably realistic and almost all the skills learned with Condor translate directly into the real world. That said, it is of course a simulator, and as such it has certain limitations that are useful to contemplate and understand. 1) There are no g-forces. Obviously. You are sitting in your chair in front of the computer and you can’t feel lift and sink. So you have to hone these skills in real life. There is no substitute. 2) Condor does a great job at modelling thermals, ridge lift, and – to a somewhat lesser degree – wave lift. However, it does not model some other real-life weather phenomena such as weather fronts, convergence lines, or sea-breeze fronts. This is an obvious limitation, especially when using Condor as a training tool for new soaring areas, where some of these phenomena are typical. 3) There are no weather hazards. With Condor you are in control of the weather settings and can select (before each flight), how strong the wind will blow (and with what variability), how strong the thermals will be, where the inversion layer is (and therefore the cloud base; or if the day is blue), if there is is wave and how strong, etc. But there are no thunderstorms, squall lines, tornados, or hurricanes. There’s also no precipitation, i.e., no snow, hail, or even rain. Condor weather is always soaring weather. The greatest wind strength at the surface is 50 kph (just under 27 kts). (Higher up in wave, it can be twice that.) Hazardous weather is obviously something you need to really think about and plan for in real life. Condor won’t teach you that aspect of soaring. 4) There are no airspace restrictions and you don’t learn radio etiquette. Condor gives you the opportunity to set up penalty zones and thereby simulate airspace but in general, you can fly anywhere and there are no TFRs. You can chat with other pilots online but you won’t learn proper radio communications. 5) Some of the controls are obviously different from a real glider unless you build your own cockpit with authentic input devices for flap handle, spoiler handle, gear retraction handle, break handle, release knob, etc. (Some clubs have actually done that but it really isn’t necessary.) You will want to use a mix of keys on your keyboard and joystick buttons for those functions. I urge everyone to at least use a good joystick and rudder pedals even though Condor will work without them. But if you want to use it as a training tool for real gliders, you need to operate the main flight controls in a realistic way so you develop the muscle memory to react appropriately. 6) Your life is not at risk. This is not just a big advantage but it is also a limitation. There is no doubt that you are likely to take more risks in Condor than you should ever take in real life (a case in point is the screenshot of the mountain pass earlier in this post). You can also see this in online racing: almost at every multiplayer race, one or more of the competitors end their flights in a crash (which in many cases would be fatal in real life). Condor is very tempting in this regard: to gain precious seconds you might scratch over mountain passes with a few feet to spare; you might fly between clouds in close proximity to mountains, you might fly in extremely dense gaggles, etc. I remind myself each time when I assume a risk in Condor that I would not be willing to take in real life. The last thing I want to do is teach myself hazardous habits. These limitations are real. You should understand them but they should in no way deter you from using Condor not just as a game, but as a tool to practice various flying techniques in preparation for real soaring. What do you need to fly in Condor? At the minimum you need the software and a computer that can run it. You find the system requirements here. A joystick with force feedback. The best one is most likely the Microsoft Sidewinder Force Feedback 2. For a long time I used a a Saitek AV8R joystick without force feedback but after reading the glowing recommendations from the Condor user community for the MS Sidewinder, I switched and I can attest that the experience is incomparable and hugely improved. The MS Sidewinder acts and feels just like a real glider stick. The forces depend on airspeed and attitude, and the stick will even indicate the buffeting in a stall just like a real glider. The MS Sidewinder has been long out of production but you should be able to get a used one on eBay. They are very sturdy and well built. I highly recommend it. Whatever joystick you use, Condor allows you to easily program any of the buttons and levers to your desired functions. Rudder pedals. There are multiple ones available and probably any of them will work well. I use T-Rudder MKIV pedals from KBSim, which are heavy and sturdy and work very well. But less expensive ones will definitely do as well. Condor has a built-in flight computer that is easy to use and specifically designed for Condor. It will help you with navigation, thermal centering and teach you all you need to know about MC speed-to-fly, final glide, arrival altitude, etc. If you also have a real-life flight computer that you want to practice with using Condor, check if it can receive GPS data through a COM interface. Most should be able to do it. Note, however, that the Oudie IGC does not allow this because it only accepts GPS data from it’s own built-in GPS. The Oudie 2 and Oudie 1 will work just fine. If you have an Oudie 1 or 2 you will also need a dedicated cable to connect the Oudie with your computer. I have no experience using other flight computers with Condor but you typically can find what you need on the Condor user forum. Finally, you will want to use earphones with Condor, unless you live alone. Any ear phones will do as long as only you can hear them. I promise that a beeping vario from your computer would annoy everyone around you in no time. You may already have several of the things needed. But even if the only thing you have is a computer, you can get all you need for about $100-400. Cumulus Soaring even sells the essential components in various bundles priced between $117 and $380 if you don’t want to follow my hardware recommendations or go to the trouble of making your own choices. The price tag may sound high, but, as I mentioned earlier, you should look at this as an investment. It will ultimately safe you a lot of money in tow fees and you will become more proficient much faster. Now, unless you are already an expert and master all the skills listed, go and get Condor. You won’t regret it.